Dwyane Wade enjoyed the second half from the bench as Miami finished its regular season.MIAMI -- With the Miami Heat entering Wednesday's regular-season finale having already secured their first-round playoff series berth against Milwaukee, Dwyane Wade could have taken the night off to rest for Game 1 on Sunday. But the star guard arrived at AmericanAirlines Arena with two objectives as the Heat closed out the most successful regular season in the team's 25-year history with a 66-16 record after Wednesday's 105-93 win against the Orlando Magic. With LeBron James away from the team for personal reasons and Chris Bosh sitting out, Wade used Wednesday's game to maintain his rhythm, and get a running start into the playoffs with 21 points, 10 assists, five rebounds and two blocks in 23 minutes. But Wade was also in the mood for a confession. As the Heat transitioned Wednesday between seasons -- from the regular season to the postseason -- an introspective Wade reflected on a season in which the Heat had the second-longest winning streak in NBA history at 27 games, posted the best record in the league for the first time, and set team records for most wins at home and overall victories. At some point, Wade said, the Heat will be able to look back with pride on what they've accomplished so far. That time, however, is not now. All the accolades and records will only ring hollow if there's not a second consecutive NBA title added to the stash in late June. The Heat's season ended in June each of the previous two years, first in a loss to Dallas in the 2011 Finals and then by beating Oklahoma City to win the title last season. 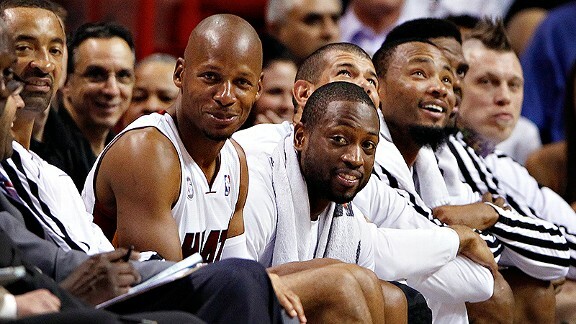 Despite everything that has happened this season, the Heat are classified in only one of two ways: champions or busts. Those are the stakes, and Wade gladly accepts them. He has seen how the Heat have taken time throughout the season to honor former players and team personnel during a yearlong celebration of the franchise's 25th anniversary season. At some point, Wade seems himself, James, Bosh and the rest of their teammates being honored for contributions to the best regular season Miami has ever had. There will be stories the players will share long into their retirements. But Wade knows the truly historic teams throughout NBA history have been the ones to string together multiple titles. Sitting at his locker before Wednesday's regular-season finale, Wade spoke at length about the challenge of joining the group of legendary teams that repeated as champions. He talked about Kobe Bryant's Lakers. Before that, there were Kobe and Shaq's Lakers, Michael Jordan's Bulls, Hakeem Olajuwon's Rockets, those Bad Boy Detroit Pistons and Magic Johnson's Lakers. Those teams had two things in common for Wade. They all won back-to-back titles in his lifetime, and they all were either coached by Pat Riley or played against his teams. So if Wade knows how special and difficult a challenge the Heat face in the coming weeks, he has been tutored by one of the league's top historians in Riley, the Heat's president. Earlier this month, in a rare meeting with reporters, Riley talked about his working vision of keeping the James-Wade-Bosh core together for a decade of dominance. Wade echoed Riley's message Wednesday as the Heat looked forward to finalizing their playoff preparation. Wade didn't search long when asked what he believed was the most difficult adversity the Heat dealt with this season. The low point came in early January, when Miami was struggling on the road and left for a six-game trip that started in Indiana against a Pacers team that gave the Heat trouble in the second round of the playoffs last season. The Heat were pounded by the Pacers on Jan. 8, then lost two nights later in Portland on a missed shot at the buzzer. The Heat finished a league-best 29-12 on the road. But the turning point essentially came during a stop at Golden State midway through that six-game January trip. Instead of walking onto the court individually when the visiting team's starters were announced, Miami altered its approach. If the Heat seemed to start the season with a bit of a championship hangover, this was the start of sobriety. The Heat hope to carry their momentum into the playoffs but realize the need to take their game to a higher level. Wade acknowledged as much when he said it takes superhuman effort to play with the same energy for 82 games over the course of a long, draining regular season. But now, it's a two-month spirited sprint to 16 victories over four progressive series. He was on the court Wednesday to give his legs one last regular-season jolt.